Sri Lanka’s largest private sector higher education network, ESOFT Metro Campus, inaugurated its 2018 Masters of Business Administration (MBA) programin Colombo last week. Close to 100 students have already enrolled for ESOFT’s MBA programs this year in the General and Data Analytics fields offered in partnership with the prestigious London Metropolitan University, and few vacancies still exist for aspiring participants. 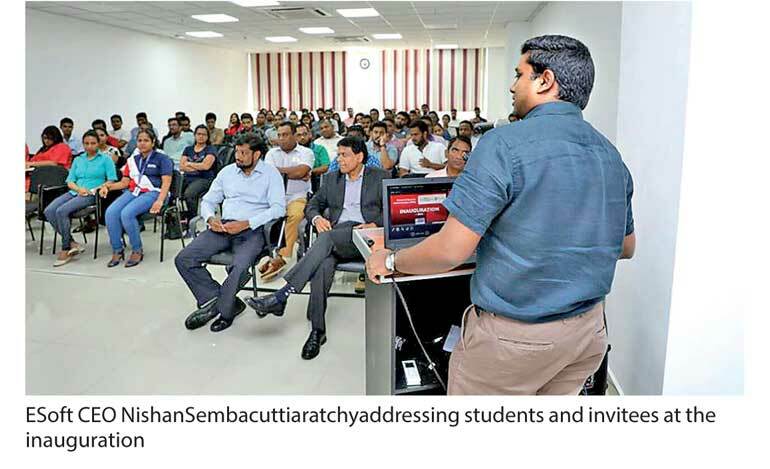 The inauguration ceremony of ESOFT’s MBA programwas graced by Maliban Group CEORavi Jayawardenaas Chief Guest and Keynote Speaker, in the presence of ESOFT GroupChairman and Managing Director Dr. Dayan Rajapakse and CEO Nishan Sembacuttiaratchy. ESOFT Metro Campus provides an ideal learning environment for students at its new campus building at Colombo 4, backed by an experienced expert panel of lecturers. The campus is renowned for its specialised curriculum where students are provided the opportunity to engage with renowned entrepreneurs, management specialists and personalities for a holistic learning opportunity. ESOFT Metro Campus entered into an exclusive strategic partnership with London Metropolitan University in 2012, a collaboration which has grown stronger whilst shaping some of Sri Lanka’s brightest talent. The syllabi are updated alongside advancements made in UK and the rest of the world, providing ESOFT students access to the very latest in education. “We offer high value world-class educational products to the same standard as available in the UK, and this led to the fast acceptance of our MBA program. The programis not diluted in anyway. We have strict entry criteria and we evaluate each and every applicant to ensure people fulfil educational and experience criteria. These value attributes make ESOFT’s MBA programone of the most sought after on offer,” said Sembacuttiaratchy. “An MBA transforms entrepreneurs and executives, elevating them to the next level of business and advancements, empowering them to take on calculated risks which will in turn fuel growth and expansion. This was the ethos of ESoft Campus since its inception, to enable an empowered future generation,” adds Dr. Rajapakshe. ESOFT Metro Campus was inaugurated in 2000 and has grown to be the largest private sector higher education network in Sri Lanka with 40 branch operations empowering over 30,000 students each year. Its educational partners include the University of Colombo School of Computing, Pearson – UK’s largest awarding body, London Metropolitan University, Kingston University, and is also accredited by the British Computer Society. ESOFT has received ISO 9001-2008 certification for its advanced education processes.